WB USA manufactures superior quality custom water treatment, purification and reverse osmosis filtration systems for practically any commercial or industrial application. We are experts in designing water purification systems that are used worldwide in applications including water treatment plants, bottling plants, water stores, bagging plants, beverage production, manufacturing processes, pharmaceuticals and many more. We can design and build systems based on reverse osmosis, ultra purification, simple filtration, media filtration, and practically any other water treatment method. 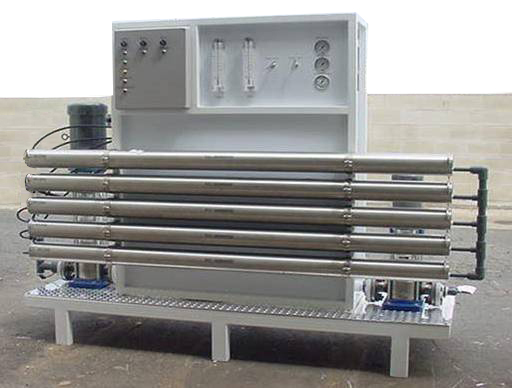 By custom designing a system based on your specific requirements and preferences you can be sure that the water treatment system will work flawlessly for your particular application. We advice people to use a custom system when water conditions may be extremely poor or when doing extremely unique water projects. All of our custom systems are made in the USA with NSF approved components to ensure that the system is a well-reviewed, tested, high-quality, and reliable system. All of our custom systems also carry 1 year warranty on parts due to manufacturer defect and include ongoing technical support via email or phone. All of our custom water treatment and reverse osmosis filtration systems include a detailed user manual that will outline operation, maintenance, and installation procedures. Like all of our other systems, we can install our custom water purification systems for you worldwide. Please call us at (760) 744-4800 or email us at info@waterbusiness.com to learn more about our custom systems and how we can design a system to meet your requirements.